Once he'd solved that one, Williams decided on a hiding place for his prize and began thinking about the paintings themselves. Pondering how to encode the crucial information in each of his planned 15 pictures, Williams' eye fell on a rotating painting he called his orrery. Like its 18th Century inspiration - a mechanical model of the solar system - this painting accurately tracked the phases of the moon. But Williams' version was filled with human and animal figures, who tumbled round in a circle as he clicked the lettered frame from one position to the next. Suddenly, he had his answer. Williams spent the next three years refining his master riddle, painting Masquerade's exquisite pictures and writing the accompanying text. He packed each painting with elaborate clues, red herrings, private jokes and a million other tiny surprises. Two of the paintings contained magic squares which, taken together, revealed how a crucial third painting must be read. 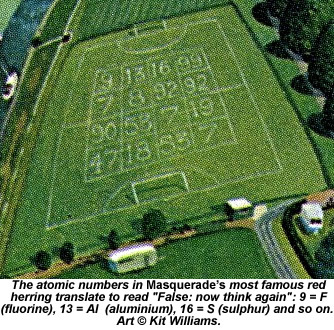 Another packed its background football pitch with atomic numbers which, when translated into their matching letter symbols, produced the message “False: now think again”. Maschler had warned Williams that the book's paintings must not show even a single pubic hair, prompting the painter to add a carefully-placed hare logo to the lowest portion of his girl swimmer's costume as a kind of visual pun. He included a Queen's Silver Jubilee tea caddy in another picture for no better reason that than he happened to be painting it while the Jubilee celebrations were in progress. For all this playfulness, Williams was careful with the key information, taking great pains to get everything right and make the puzzle's mechanism function smoothly. He surrounded the master riddle with a host of what he called “confirmers” pointing to the same solution. These were designed to reinforce the conclusions of anyone solving the main riddle, assuring them they were on the right track and following more than a string of chance co-incidences. The prose of his story was packed with secondary puzzles too, many of them mimicking the verse riddles of the 10th Century's Exeter Book, which Williams loved. Maschler's excitement was a little dampened by the realisation he'd forgotten to warn Williams that any lettering in the paintings should be done in simple black characters to let foreign publishers substitute their own translated text. In fact, Williams had rendered the poetic phrases surrounding each painting in grey or red letters, each one painted to look as if it had been chiselled into stone. Not only that, but the very format he'd used to construct his puzzle meant the paintings' lettered elements would be next to untranslatable anyway. Maschler swallowed hard and said nothing, resigning himself to an English language edition alone. The good news was that the paintings themselves were astonishing, and that Williams' story to accompany them turned out to be better written than the publisher would have dared hope. Far from the extensive rewrites which he had assumed would be necessary for such an inexperienced author, all that was needed was for Cape's editors to correct the artist's somewhat eccentric spelling. Williams left Maschler's staff to get on with preparing the book, and returned home to make his hare. “I had never made jewellery, although I had worked in brass, steel and copper,” he later wrote. “From one piece of gold, I cut the outline of the hare, five and a half inches from nose to tail, then sawed out and drilled the filigree work within the body. The other piece of gold was enough to make the hare's legs, ears and tail, which I riveted to the body. Everything else - the bells and their tongues, the chains the tiny animals, had to be made by melting down the remaining scraps of gold, beating them into coin shapes then cutting them out.” (5) He wrapped the hare in paper, placed it a terra cotta casket which he'd made to defeat metal detectors and filled the remaining space inside with melted wax. The inscription on the casket read “I am the keeper of the jewel of Masquerade, which lies waiting safe inside me for you or eternity”. All that remained was to bury it at Williams' chosen site. A few days before the burial, it occurred to Maschler that the event would need a witness. For secrecy's sake, Williams was determined to bury the hare himself, and to do so with no journalists or cameras present. Maschler persuaded him that one unimpeachable witness should go along though, if only to prevent Masquerade sceptics arguing they had no proof the hare had ever been buried in the first place. The publisher's first choice would have been the Archbishop of Canterbury or the Governor of the Bank of England, but it seemed unlikely that either would be available at such short notice. Argent started serious work on the show around March 1981, when Andrew Lloyd Webber's Cats was preparing its first West End run. Argent had agreed to join Cats' orchestra as first piano for the show's opening five weeks, and used his downtime in rehearsals to study Williams' book. “I remember sitting in the auditorium in Cats, looking through Masquerade, trying to get to grips with the structure of the piece and how it was going to go musically,” he said.